This post will guide you on how to backup/restore your formulas you created in the IDWedge Pro program. It also guides M280 users on how to backup their Scanned Images. Step 1: From the Main form, select Settings->Backup/Restore. Step 2: Click Backup Formulas button, using the default path of C:\Tokenworks\IDWedgePro\Backup. This will create a backup file of your formulas. NOTE: If you are backing up the formulas because you are going to transfer formulas between PCs, format your hard drive, or change operating systems. Copy the file: SuperIDWedge_xxx_xxx.sdf to a usb drive, removable media or a network drive/cloud account. Once the new install of the IDWedge Pro is completed, copy the original Backup File in C:\Tokenworks\IDWedgePro\Backup. Step 3: To restore your formulas go back to Settings->Backup/Restore as you did in Step 1. Select Restore Formulas. 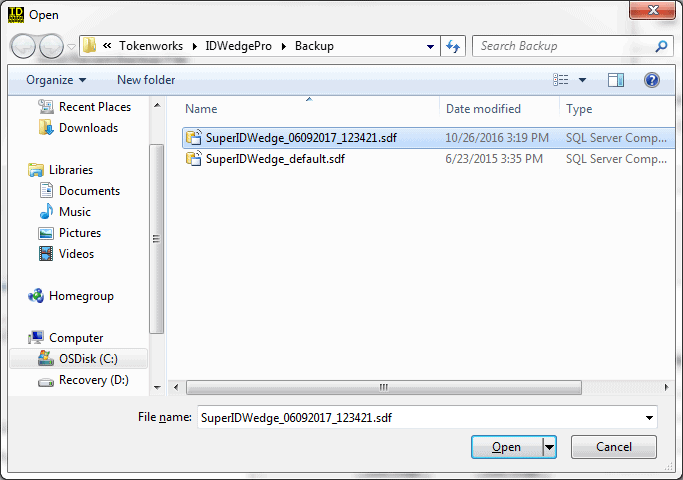 A file dialog will open to the backup folder, click on the SuperIDWedge_xxx_xxx.sdf file you wish to restore and click open. After selecting the Backup File you will see a dialog box asking if you want to proceed with the restore. Click Yes. 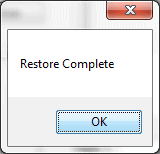 Another dialog box will appear letting you know the restore has been completed.